Water is transported in plants, from the roots to the leaves, following a decreasing water potential gradient. Transpiration, or loss of water from the leaves, helps to create a lower osmotic potential in the leaf. The resulting transpirational pull is responsible for the movement of water from the xylem to the mesophyll cells into the air spaces in the leaves. The rate of evaporation of water from the air spaces of the leaf to the outside air depends on the water potential gradient between the leaf and the outside air. Various environmental factors, including those conditions which directly influence the opening and closing of the stomata, will affect a plant’s transpiration rate. This experiment will measure transpiration rates under different conditions of light, humidity, temperature, and air movement. The data will be collected by measuring pressure changes as the plant takes up water into the stem. Observe how transpiration relates to the overall process of water transport in plants. 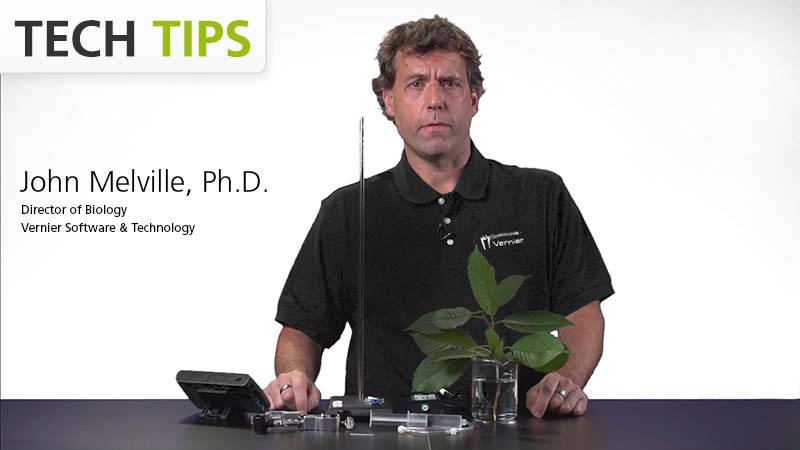 Use a Gas Pressure Sensor to measure the rate of transpiration. Determine the effect of light intensity, humidity, wind, and temperature on the rate of transpiration of a plant cutting.